Looking to bag a Black Friday Amazon camera deal? Here are 10 slick snappers to search for. What's the best camera you can buy from Amazon this Black Friday? With early Black Friday camera deals starting to drop from the retailer already – plus a host of Amazon Cyber Monday camera deals due on the 26 November – we're expecting prices to only fall further in the coming days. But a quick glance through the Amazon camera section shows an overwhelming amount of options... So we've pulled together this guide, walking through 10 of our favourite snappers on sale at the retailer right now. After all, Amazon is the perfect place to get a good price on an existing or classic camera that might be hard to find on the high street – you just need to know what you're looking for. And with so many sellers, you're likely not only to find a low price, but also to see some great-value bundles with lenses and other accessories. Selling with a 15-45mm XC lens, the recently launched Fujifilm X-T100 camera has a definite wow factor. 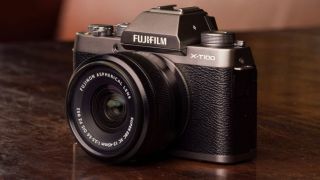 A mirrorless camera with an APS-C crop sensor, the X-T100 wears Fujifilm's signature retro design (it looks like an analogue camera) but on the inside, it offers top-class image quality. Available in black, dark grey and champagne gold, the X-T100 presents consistently sharp 24.2MP shots on its tilting three-inch touchscreen. Though its 4K video is a bit of a letdown (offering only a jerky 15 fps), here's a great combination of style and value that's always simple and intuitive to use. This is a fantastic camera on sale at Amazon – and you'll see today's very best prices above. As entry-level DSLRs go, there are few better than the fast, agile and lightweight Nikon D5600. However, let’s start with the lowlights. Nikon’s attempt at an always-on link to a smartphone – called SnapBridge – is slow. And the D5600 only deals in Full HD video, not 4K. Are you put off yet? You shouldn’t be, because when paired with its 18-55mm kit lens the D5600 consistently produces great 24.2MP images. Just as importantly, it’s easy to use, with both an optical viewfinder and a great auto-focus system for its 3.2-inch vari-angle touchscreen. Travelling a lot and don't want to carry a DSLR? Or fancy a day off? Cue the pocket-sized travel zoom camera, of which Panasonic is a past (and present) master. It's latest is the selfie-friendly (thanks to a swivel screen and 'smile shutter') Panasonic ZS70 / TZ90, whose biggest feature is nevertheless a mighty 30x optical zoom. If that lends versatility, so does 10fps continuous shooting and a 4K video mode, while impressive detail comes from its 20.3MP sensor paired with an effective image stabilisation system. The only drawbacks to this WiFi-ready compact are slightly soft wide-angle images and an electronic viewfinder that's just too small. Are mirrorless cameras the future? Certainly not all photographers are sold on that statement, but there is a definite push from the major manufacturers. A key product of that movement is the Nikon Z6 full-frame mirrorless camera, an entry-level shooter that sits under Nikon's flagship, the Z7. Available from late November and on pre-order now, the Z6 sports 24.5 megapixels, an ISO range of ISO100–51,200, and full-frame 4K 30fps video capture. Although it's being sold by Amazon as a body-only deal, the Z6 can take large Nikkor Z lenses on a new larger diameter mount, though an adaptor is included that allows all Nikkor F mount lenses to fit. Everyone’s going full-frame, it seems, and there are few better places to start than the reliable Canon 6D Mk II. Its success is more down to tweaks in its usability rather than outright image quality, for sure, but that’s not to play down the quality of its noise-free 26.2MP images. Sure, that resolution has been surpassed by both Canon and Nikon, but the 6D Mk II remains an awesome choice for travel photography. Its 765g weight is the reason, though it does lack both 4K video and a second SD card slot. Still, it’s a top all-rounder and an excellent, affordable full-frame DSLR. The Olympus OM-D E-M10 Mark III is one of our favourite travel cameras – and it's going for less than the price of a long-haul flight. Selling on Amazon with a 14-42mm EZ lens that's remarkably small despite offering a motorised zoom, this is the least expensive Olympus OM-D kit. A mirrorless camera with a micro-four-thirds sensor, the E-M10 Mk III boasts 4K video, an upgraded autofocus, and a 16 MP sensor, so in terms of detail, it's not hugely advanced. However, the E-M10 Mk III is all about being lightweight and nimble, and offers great value within a timeless retro design. Are you ready to take a deep dive into underwater photography? Able to go down to a whopping depth of 30 m/100 feet, the Coolpix W300 is tough stuff indeed. As well as that unbeatable waterproofing, this compact adds a barometer to produce underwater data (such as altitude and depth,) and even has a built-in compass. Back on the surface, you can transfer images quickly and easily from the W300 to a smartphone via Bluetooth. The presence of 4K video is unexpected, though just as useful to outdoor adventurer photographers will be its drop-proof rating of 2.4 m, and its freeze-proof rating down to -10ºC/14ºF. If you’d rather steer clear of expensive full-frame sensor cameras, head to a top-draw crop-sensor model like the Canon EOS 800D. Canon's top of the range entry-level DSLR, this 24.2MP shooter goes for ultimate connectivity, boasting built-in Wi-Fi with NFC, and Bluetooth, and while it’s only capable of capturing Full HD 1080p video, it does add HDR and a time-lapse mode. Armed with a 3-inch vari-angle touchscreen, 45-point autofocus system, and six frames-per-second shooting, the EOS 800D – sold on Amazon with its EF-S 18-55mm f/4-5.6 IS STM kit lens – is one of the finest entry-level DSLRs around. Are you ready for a close-up of the world's biggest zoom? Despite the camera industry insisting we all focus on mirrorless and other high-end cameras, there's something about this Coolpix 1000 superzoom bridge camera that will appeal to a lot of travel photographers. We're thinking of those going on a safari or wildlife shoot, who could make a lot of use of the P1000's massive optical zoom. It even takes 4K video at 30fps, shoots seven frames per second, and has Wi-Fi and Bluetooth for easy transfer of files to a smartphone. However, since it only manages 16 megapixels, the detail from that 24-3000mm-equivalent zoom lens can be mixed if you try to zoom and crop. Why bother with the very latest version when an older, cheaper model will do almost as well? Camera-buyers have always had a healthy respect for classic models, and that certainly applies to this premium, pocket-sized camera. Sony's third-generation enthusiast's favourite, the Sony RX100 III, creates 20.1 MP detail from its one-inch Exmor R CMOS sensor, a Zeiss Vario-Sonnar T 24-70 mm lens with f1.8-2.8 aperture, and also has a built-in OLED electronic viewfinder (EVF). Sure, there are more advanced – and far pricier – iterations of Sony's RX line-up, such as the RX100 VI, but if you want a reliable, precision-engineered performer with a simple point-and-shoot operation, the RX100 III fits the bill for a low price.